I cannot believe I have reached this milestone and it is all because of YOU. I started this blog because I wanted to share what I did with like minded people and of course meeting new people is something I have really enjoyed. So here is to my 300th Post and to celebrate a little Giveaway. As you know there is always rules for giveaways but you don't have to do any of these except leave me a comment. I first have to tell you I redid my Giveaway Banner to include the link directly to this 300th post in case I post other things before the draw so if you have already posted this on your blog, please remove it and snag the new one with the direct link. 4. If you are not a follower and become one you get another chance, I would really like to reach 200 followers this year so that would make me really happy. 5. If you know or remember my Cat's name you get another added chance to win. And here is what you will receive, what you see is not necessarily what you get because the pile is already growing. There is even a little baggie you can't see with bonus items in it. 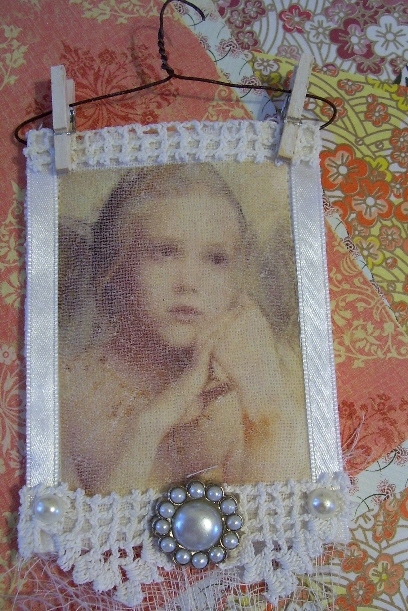 Papers, one of my key chains with ring will be provided, one of my shabby Angel hangers, the pic does not do this justice, sorry again I am no photographer. 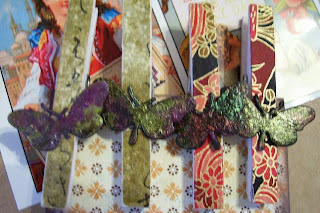 Burnt and painted glue butterflies, altered clothespins with butterflies to put on packages, give bags ie you can clip your birthday card to a package so it is all in one place!!! !, Artchix images, a couple mini dominoes so you can alter them yourself, some wood jewelery items from Artchix, apply an image and attach to a chain or your artwork. The ring will be provided for you to attach, it is easier to send separate for shipping. 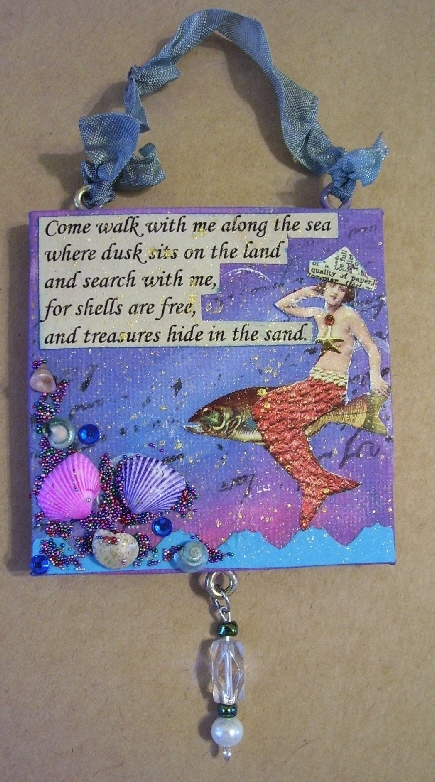 And I was so excited to do a mini altered canvas with an Artchix mermaid image, the verse came with the images, shells from a swap and I added the crinkly ribbon and some micro beads, and.....I also made the dangly bead hangy thing on the bottom. Love how these turned out. Thank you to all who have commented and have become my blogger friends. Where would I be without you...probably not blogging. Good luck, you have til January 14th to comment. I will pick the winner on Sunday. Remember if you do not have a blog I will need to get in touch with you so please leave me your email address or some way to contact you. I have replaced your button with the new one! thanks for stopping by my blog! Wow, Les, everything looks so nice! I am still stuck on that key chain from the counter samples...wonder if you could paint them also? What a great idea! Please enter me! Please enter me in your contest. I am already a follower and I have your blog listed on my side bar, is the button thing different? GIve Rosie a pat for me! What a milestone! Congrats! Of course you already know I'm a follower and your button is already posted on my blog. I honestly didn't remember Rosie's name but thanks to Becky we all know it now. This is an awesome and generous giveaway Les. Keep creating, blogging and inspiring! Good morning Les.. whoo hoooo!! congrats on 300 posts.. Did a post this morning.. have your giveaway button on the side and hugs to Rosie this morning.. I dd remember before I read Becky's post...lol...I am a follower too.. but you know that.. Congratulations!! 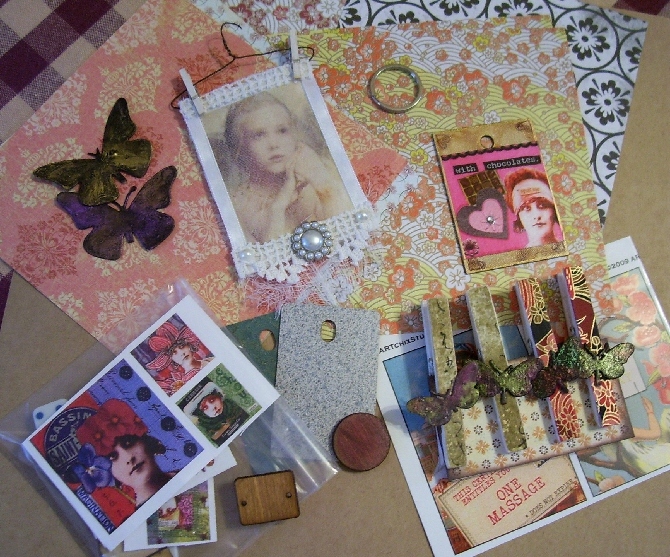 Of course your give away package is lovely as are all of your projects..what a delight to win!! I have posted your new button. 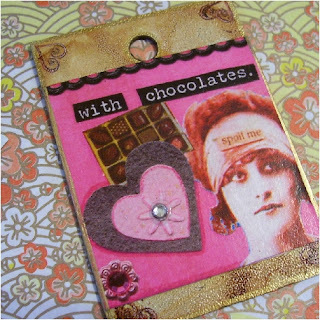 Congrats on your milestone- I love your blog and always am inspired by your projects!!! I don't usually become a follower of a blog just to enter a giveaway. But since you said it would make you really happy, here I am, an official new follower. Can't wait to see more of your work, and good luck reaching the 200 mark! Much congratulations on reaching this amazing milestone, Lesley! 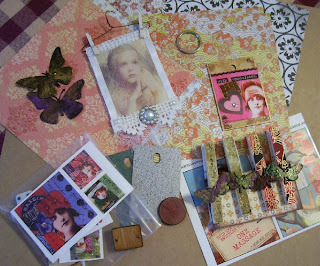 I'm do happy to be one of your followers, blog friend, matchbox devotee, and past recipient of your beautiful artwork. Here's to 300 more!